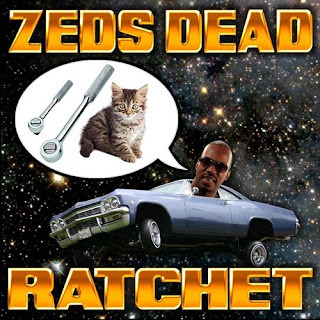 I probably should of posted this Zeds Dead trap anthem "Ratchet" featuring some vocal work of Juicy J yesterday since it is a weekend banger, but Saturday afternoon will suffice. The track is short, clocking in under 3 minutes, but it is sure to get your speakers banging. Plus, that cover art above is too funny, I literally keep looking back at it and laugh. If you are digging this you can download it over at our Facebook page here.